A San Jose police officer was fatally shot on Tuesday night and the suspect was found dead. SAN JOSE, Calif. -- San Jose police say Officer Michael Johnson was killed in the line of duty during a shooting on Senter Road, Tuesday evening. The suspect, identified as 57-year-old San Jose resident Scott Dunham, was found dead at his apartment and a long standoff took place late Tuesday night. Just before 3:30 a.m. Wednesday, San Jose police say Dunham was found dead on the apartment balcony with a gunshot wound. Police said the only shots fired from police were from the initial encounter with Dunham on Tuesday night. The cause of death is under investigation. Earlier on Tuesday, San Jose police Officer Albert Morales said they received a report that a drunk man armed with a gun was threatening to kill himself in the 2600 block of Senter Road around 6:50 p.m. When police officers arrived, police said Dunham opened fire from inside his residence. One of the officers was shot and pronounced dead at the scene. Evacuations took place around the Dunham's apartment on Senter Road and authorities told residents that they may not be able to return home until Wednesday. Johnson worked patrol and was also a field training officer and worked with recruits. He was not with any recruits when he responded to the incident. "Officers were obviously crying, weeping. They will do so for quite some time," said San Jose Police Spokesman Albert Morales. "This is a difficult day for us and our community," said San Jose Police Chief Larry Esquivel at a news conference. "I can assure you the person responsible for this act will be apprehended." San Jose Mayor Sam Liccardo also spoke at Tuesday's news conference. "This strikes at the heart of all of us in San Jose and throughout the region. 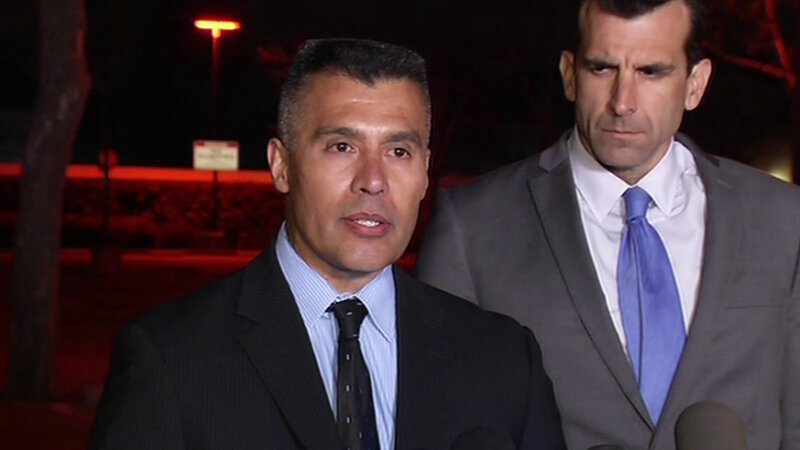 We will continue to do everything necessary to ensure the safety of the community in the are and to bring this assailant to justice," Liccardo said. Veteran San Jose Police Officer shot and killed responding to a call for service. Earlier in the evening, ABC7 News reporter Lisa Amin Gulezian reported that police had asked her to move several times due to the volatile situation. In a tweet, she said an officer told her that "a high-powered rifle could be pointed at you right now," as officers evacuated the Carribee shopping center at 2875 Senter Road. An employee at a Vietnamese restaurant on Senter Road, a block away from the shooting, said police informed them that there was somebody in the area with a high-powered rifle. The employee, who declined to give his name, said police instructed them to shelter-in-place at the restaurant, where there were roughly 20 customers inside. Condolences from police departments throughout California began pouring in on Twitter late Tuesday. "Our thoughts and prayers are with the families of San Jose PD at the traffic loss of a fellow peace officer," the Sonoma Sheriff's Department said in a tweet. According to the San Jose Police Department website, the last time an officer was killed in the line of duty was Officer Jeffrey M. Fontana in 2001. ABC7 News reporter Lisa Amin Gulezian is in San Jose. Click here to follow her on Twitter for live updates. The Associated Press and Bay City News contributed to this story.